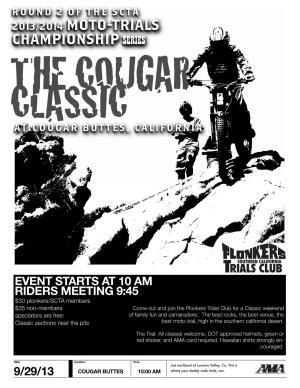 Oh yes, the second event of the 2013/14 Season is upon us, that of course being The Cougar Classic in beautiful Cougar Buttes. Complete with the traditional 'Adventure Ride' to the plaque on Saturday. If you've never gone, you gotta go. Just ask my buddy Russ! Glorious flyer will be in the mail, and available for download, by tonight. I swear!